H&A provided civil engineering services for the development of a new civic center complex located on an old school property for the City of Vista. The site included 100,000+ sf of civic center facilities, including an emergency operations center with parking for over 400 vehicles. Design for reconstruction of abutting public streets to appropriate street widths per the City standards. This work included analyzing detailed survey data to design appropriate transitions to existing pavements. 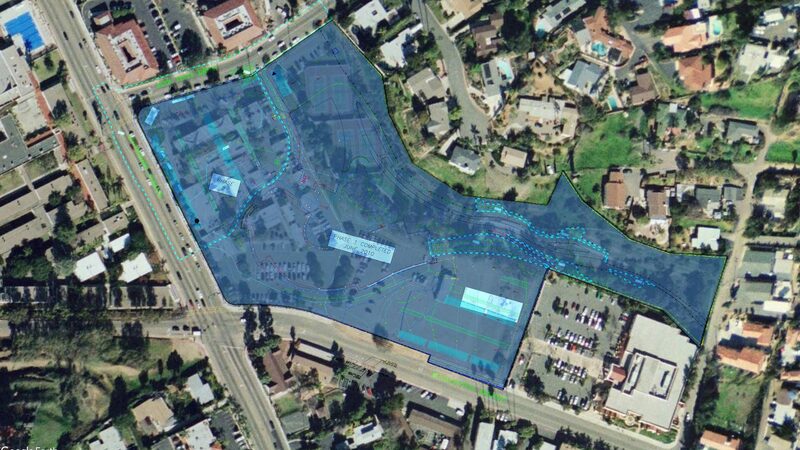 Design for low impact development measures and storm drain retention basin to facilitate earning certification of the project for LEED Silver. Design for the parking lot included use of bio-retention and pervious pavements to meet water quality objectives for reduction of pollutants. Incorporated trail network solutions into the site design to establish accessible links from public sidewalks through the site and to adjacent park property. Prepared precise grading and drainage plans providing details for site design of pavements and drainage of landscaping areas. Design included establishing accessible paths of travel to the existing library, as well as renovation to parking and access walks at the library to meet current accessible guidelines. Provided utility plans for extension of sanitary sewer, potable water and fire protection to the buildings. Planning for phasing considerations to allow city staff to occupy existing facilities on a portion of the site during construction. Site design integrated existing grade differentials with building access. The linear park and EOC facility are located at the second-story level of the Civic Center, allowing direct access from the second floor.